So what's the secret? It's actually really easy. Since Pinterest has come out as saying that they are happy with scheduled posts and won't penalise you for it, I have been using Board Booster to schedule all of my pins. They can also grab new pins for you to really make it easy for you but after a week of using that I found that it just wasn't 100%. I need to be sure of the content that's going out to my followers. I need to know it's good and not spam and be sure it's what I love and what Kirsty Girl followers will love too. UPDATE: They have updated this feature and you can now send out only approved by you pins. Awesome! What it essentially does is pin from your own secret boards to your public boards over a time you specify (which is great for me being an Aussie and all my lovely American readers who may not see my pins otherwise). You can also set it to post as many pins as you like within that timeframe and they all go out automatically. There are many other programs out there that essentially do the same thing but this is the one I'm using (for now). At the moment it's FREE but it will be a paid service in future based on how many services you use (i.e. how many pins are sent out). I won't bother going in to the details of how to set it up unless you ask in the comments because it's very easy and I'm sure most of you will understand it. Simply set up a secret board, I have about 13 secret boards, all named after the public board they'll post too with 'secret' at the end, then I just link the boards up and wallah! Each week I pin around 35 pins to each secret board to go public during the week (that's 5 pins for each board per day). One of the most important things is to pin images straight from the source rather than simply repinning. This makes a huge difference. Of course you'll want to repin a little as well but my ratio for each board now is around 75% pinned from source and 25% repins. I started off small with around 300 followers, it was a week of slow growth at first but the new followers I was getting every day was slowly rising and has now hit 50 a day and it's showing no signs of slowing down. Of course there are other methods I've been using that have helped as well but for the most part this method has given me by far the biggest boost I've ever seen. I have literally doubled my Pinterest followers in under 2 weeks and the best part is they're REAL followers. Pinners who have seen my stuff (because Pinterest loves active members and shows them off) are following my boards because they want to. No fake or spammy followers to be seen! Pinterest is ultimately a search engine, just like Google. They love active members who pin relevant content often. Schedule your pins for maximum growth and reach new Pinners. Have a 75 - 25 ratio. 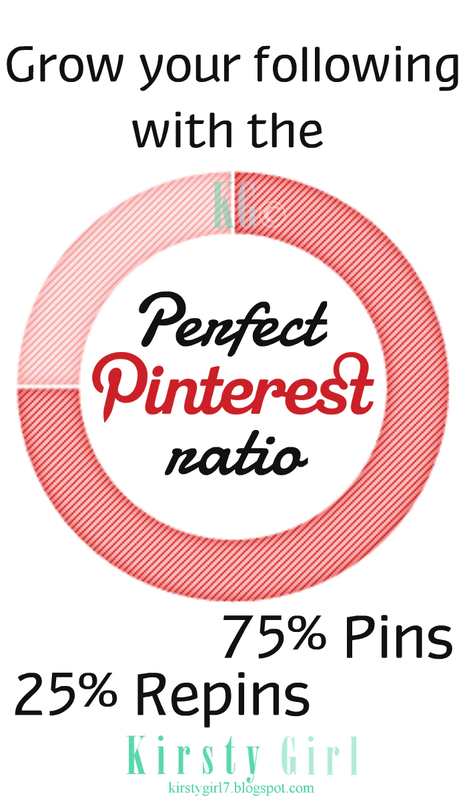 75% of your pins should come straight from the source with 25% repins. Pin throughout the entire day to reach different followers. And there you have it. 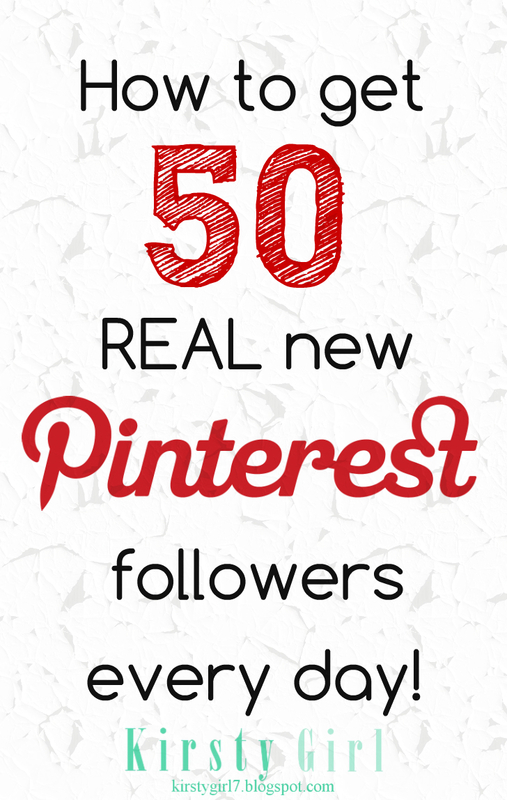 One very simple yet highly effective way of getting 50 new REAL Pinterest followers every day! This post is part of the "Blogger Online Panel" hosted by Jill @ Blog Chicka Blog. Read Jill's BoardBooster post and find other blogger panelists posts here: Feeling Overwhelmed with Pinterest? Set up with BoardBooster...and forget about it! Great article. I am going to have to study this. I had never heard of Board booster. Thanks so much Leigh! Let me know how you go! I've been following new boards for weeks now, like I follow almost every blogger I come across on Pinterest (5-10 new bloggers a day). I pin a lot throughout the day too, about the same radio of source/repins as you, as I'm home and have time to do it. I've had about 5 new followers in two weeks. I get the absolute least traffic or new followers from Pinterest. I'm some kind of anomaly. Oh no! How long have you been doing it for Stephanie? I sometimes find that bloggers don't like to follow those on social media who follow WAY more than they have followers because sometimes that can come across as spammy? Maybe a better way would be to keep pinning and only follow those you truly like? I don't really know of course but it's the only thing I can think of! Either way I'm going to stop by and follow you! :) If you do try out anything different let me know how it goes. Just maybe three weeks. I had read numerous bloggers say that you should follow new people every day and pin for 15-20 minutes several times a day, so I was trying that out. I can honestly say I've seen no difference. But I do see a lot of people who have thousands of followers but only follow a few hundred. Also there's the pin parties where you're required to follow all the hosts and co-hosts, and maybe 10% of them follow me back. It kind of feels like a double standard. I mean, I get that it's *their* blogs, but if no one linked up or followed them, there'd be no growth. So it feels a bit like "do this work for us but we can ignore you since we're doing you the favor of hosting a link-up." Maybe I'm just too sensitive about it. Wouldn't be the first time. It's just something that's always kind of bothered me. Interesting. I'd never heard of that one before! I haven't found that Pinners bother to really follow back. I find that works really well for G+ though. I totally get what you're saying with those Pin parties and I do agree.. I think we should all make more of an effort to support anyone that supports us! I never got secret boards before...now I get it! Great information...I need to follow all of your advice. Thanks for sharing with the Thursday Blog Hop! Oh thank you! The only free Pinterest Scheduler I'd used before was Viralwoot and I only used it for one day because it was awful. This one looks great! I guess I'm not getting it, why do you want new pinterest followers? so you can get your own blogs read, is that the only benefit for getting more followers? do you sell items on your blogs or just get affiliate benefits? and why do you have "secret" boards? do you try to get the same people folling those too? thanks in advance for all you help. Thanks for sharing this. A lot of my time is consumed by pinning and being on pinterest. I am going to have to try this and see how it goes. Growing so many social media networks at a time is hard work! I've always found pinterest to be a bit hit and miss so this is great to read. Thanks! Pinterest just lie the rest of the search engines keep changing it up to keep us on our toes. Thanks for sharing your knowledge. I've always wondered how to schedule my pins. It is such a pain to try to set reminders and attempt to remember what posts I've pinned, etc. Thanks for sharing! This is a great concept. I did follow the link, but apparently they are charging for the service now, which I can understand. I wish Pinterest had their own scheduler. I'm glad you are doing so well with it! Thank you for sharing at What We Accomplished Wednesdays. Have a great weekend! Oh I believe they're direct from the source... when I say that I just mean you're pinning from an actual website as opposed to just repinning something someone else has already pinned to Pinterest. Pinterest can then see that you're adding more valuable content for them and they boost your visibility. I don't have anyone following my secret boards... they're just what they're called. Secret and only for me. That way I can pin a whole bunch of things at once but not spam my followers and then boardbooster pushes them out to my public boards over the times I specify to gain maximum exposure. Yay! I also have a gift board which never gets seen so that I can put present ideas for my friends and family.